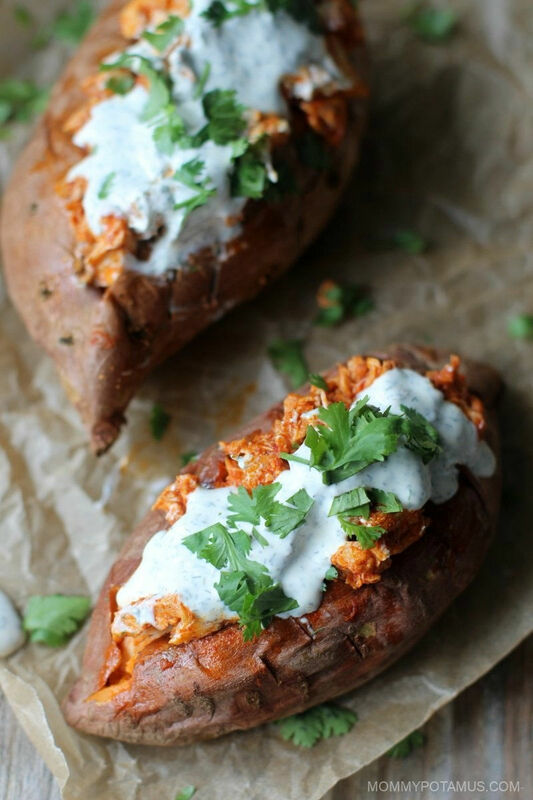 I’m not saying they’re relationship therapy exactly, but these buffalo chicken stuffed sweet potatoes are peacemakers in my house. My love of homemade red chili sauce, buffalo wings, chimichurri and all things spicy is the complete opposite of my husband, who prefers rich, creamy sauces and dips. Since these stuffed sweet potatoes have both components, we both get we want. Win win! 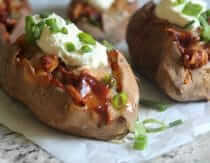 Oh, and if you love this recipe I think there’s another one you will to – BBQ chicken stuffed sweet potatoes. While the potatoes are cooking, mix together the sour cream, parsley, dill, salt and 1/2 teaspoon of garlic powder. If you prefer a thick and creamy topping, set it in the fridge for later use. If you prefer a thinner, more pourable topping, add a few tablespoons of milk until the desired consistency is reached. When the sweet potatoes are ready, turn the oven off and let them sit in the oven while you prepare the buffalo chicken. 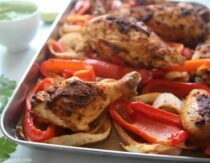 In a saucepan, combine hot sauce, butter, smoked paprika and 1/2 teaspoon garlic powder over medium heat. When the butter is melted, stir to combine the ingredients and add the chicken in. When the chicken is warm, remove the sweet potatoes from the oven and stuff the chicken in the sweet potatoes, dividing equally. Top with ranch dip/dressing and cheese or green onion if using. This looks fabulous! I love sweet potatoes, but this combination had never crossed my mind. It’s on the menu for next week. 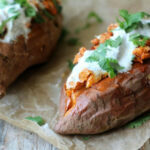 I’ll make my husband’s with a white baked potato, but certainly a sweet potato for me! 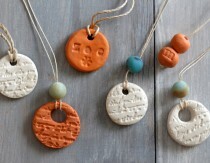 I will have to try these! Btw, all the recipe ingredients are listed in paragraph form at the top of the recipe, and listed below. Oops! Thanks for catching that, Monica. Correcting now . . . This looks great. 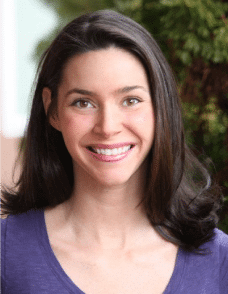 Can I use coconut oil instead of butter? I have subs for the other dairy. Thank you. Great recipe! I’ll have to substitute the cheese and dairy for more lactose-free ingredients, but otherwise, I think it will be really good to try! I might also try cubing the sweet potatoes, and cook them along with the chicken, and then add it to spaghetti squash. Thank you for the great idea! 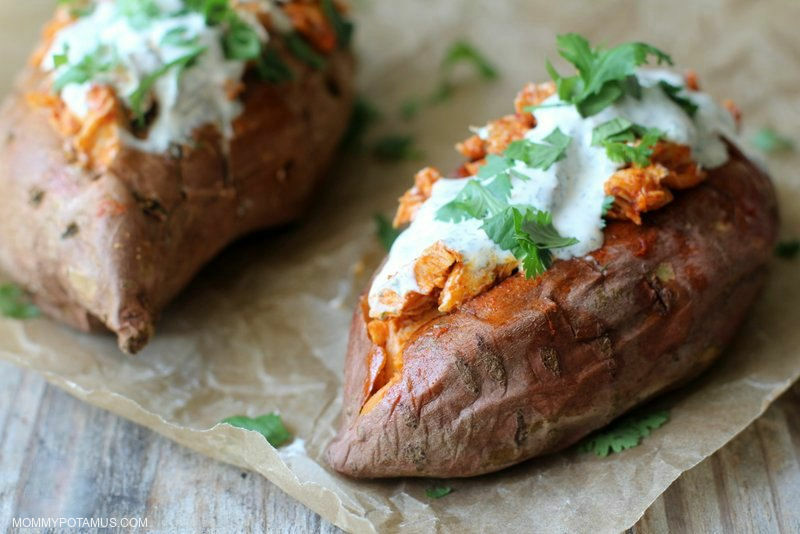 I wouldn’t have thought that buffalo chicken and sweet potatoes go together, but now I’ll have to give it a try! Hi I just started following your site and would love to make this recipe. We don’t do spicy or hot foods in our house because it upsets our stomachs. Do you have a recommendation of a mild sauce we could substitute with?